The last 5 days of the month of Karttika are traditionally known as the Bhishma Panchaka or the Vishnu Panchaka. 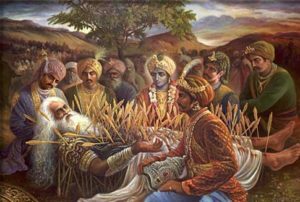 In the Hari Bhakti Vilasa, it is said that if one is capable, one should observe fasting from certain foodstuffs on the Bhishma-panchaka for the pleasure of the Lord. The Padma Purana say that one pleases the Lord and makes spiritual advancement by such austerities.